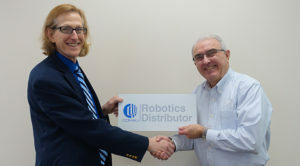 Comau is proud to announce a new partnership in the USA with a local robotics distributor, Kundinger, Inc. Founded over 50 years ago, Kundinger has an innovative approach to integrated supply and serves a variety of customers in unique market segments. They believe customers deserve premier products, custom designed systems, and personal customer service. Kundinger will offer Comau’s full portfolio of robots and automated products to its customer base in Michigan and Wisconsin. This partnership represents a key step in Comau’s strategy to develop a distributor network in the USA.